I'm sure every woman or girl look for products to get smooth nice looking feet. We all know those products can be expensive, but don't worry I have you covered. The ped egg is a miracle for all feet! It's great for making your feet smooth and soft. This is my favorite because it works really good. I've been using this for a few years now and I definitely recommend it. You should definitely check it out and maybe add this product to your foot care routine! I got mine from CVS for $9.99. You can go to CVS or you can check these websites out for the product: Amazon and Walmart. The Vaseline total moisture lotion leaves your skin feeling soft and looking healthy. It includes pure oat extract + stratys 3 (multi-layer moisture). The great part about this lotion, is that it quickly absorbs in your skin without leaving your skin feeling greasy. This is the main reason why I like this lotion. Sometimes lotions leave my skin feeling sticky; that really gross. This lotion is great for my skin. This lotion will help anyone who is experiencing any dry skin. I do recommend this product. It can be found at any drugstore, I got it from Walmart. 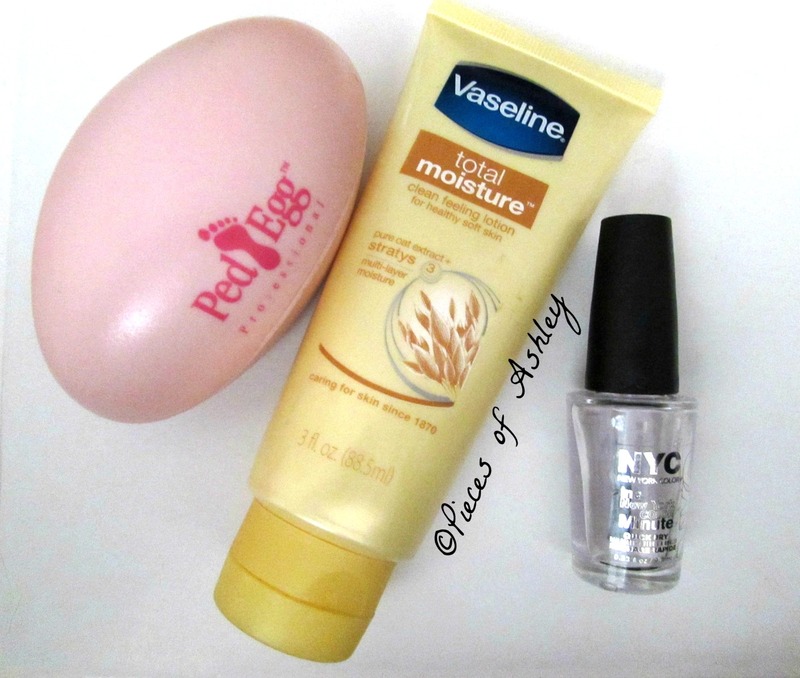 If you want to know more click this link: Vaseline: Total Moisture. This is a clear polish/ top coat. The great about this polish is that it quickly dries. I mean who has time to wait 20 minutes for their nails to dry. It only takes about 5 to 6 minutes to dry, that's great. If you're going to a party and you're in a rush, get yourself together and in the end quickly paint your nails. Another idea would be if you're not the one who's driving, you can do your nails in the car! I definitely recommend this polish, it was about $1.99! It can also be found at any drugstore, I go to Walmart or CVS! Vaseline is my fave too!